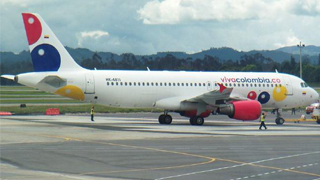 Budget airline VivaColombia is giving new meaning to ‘no-frills flying’ by proposing that all passengers stand while they fly. It says by removing all seats from its planes, it would drive down the cost of fares and allow it to squeeze more passengers into each flight. “There are people out there right now researching whether you can fly standing up. We’re very interested in anything that makes travel less expensive,” said VivaColombia’s founder and CEO William Shaw in an interview with the Miami Herald. Crazy as it sounds, it’s actually not a new idea. In 2003, Airbus pitched the idea of a vertical seat, which would give pax something to brace against, while in 2010 Ryanair proposed standing areas on its planes, featuring “bar stools with seatbelts,” as honcho Michael O’Leary described it.